An interesting read Fenlander and particularly the fact that this current set up is basically handled by you alone which is what I am doing for most of the time. I always find these things to be a compromise between the ' ideal ' boat and one which has the practical advantages that suit our needs, I guess like most things in life. In some ways I wanted to buy another Zodiac but as a retired old tart, the cost was too high and the Honwave offered a great boat for the money. I only wish I had bought a 3.2 instead of the 3.8 which may have been more manageable off the water. I have the time to reflect during this winter period what direction I will take regarding the Excel 330. I do believe the boat is a good quality craft for a flat floor SIB and perhaps the very flat water I have been using it on has shown it in it's worst light but my heart and head is leaning towards those folding ribs but I will wait until I have had the opportunity to try one out before making my mind up. I am down your neck of the woods in a fortnight for a weeks holiday in Suffolk near Southwold and was toying with the idea of taking the SIB with us but knowing the seas this time of the year, we may just stick to a bit of clay shooting and fishing the lake where we stay. Well only roughly our area... we are clinging onto the western edge of Cambridgeshire in a village near the A1. Know that bit of coast well though as we've been going there on and off all my life. You going to High Lodge? That's a place I've not been but others of our family have. Very tidy and well run. I know Southwold well... particularly the harbour entrance which can get quite unsuitable for SIBs and looks a small target once you get some way out. Slipway's often muddy too, have you launched from there before? But all round it's a great area to visit. I'd buy a Honwave 3.2 air floor too... except for an irrational dislike of the trim tab arrangement and the curvy wheels needed. Just noticed on your pictures you have the pointed tubes & failed to notice it's a 4004, I didn’t realise they had different seat fixings. It's interesting and maybe a little re-assuring to hear somebody with your experience confident enough with the transom to fit towing eyes, my local Force 4 advised me not to fit them, I was going to buy a Ringo from them but they suggested the transom on the Zodiac would not be strong enough, this and the numerous de-laminating threads is off putting. I'm relatively new to this, & possibly been put off a little from researching. I must take the air-floor out to see what you mean regarding re-routing the tube, sounds like a worthwhile modification as it is a pain. Being comfortable around engines I don’t get too concerned about the motor but rather ignorantly presumed that there can’t be much to consider buying a blow up bag to throw it on. Yet the blow up bag requires so much more maintenance then the motor. Yes, you have guessed, High Lodge where we have been going two or three times a year for the past 10 years, love the place. I have launched the kayaks from there many times but not the sib although there is a slipway down by the pier but to be honest the sea gets very choppy this time of year with a heavy shore dump so I think the sib will stay at home. 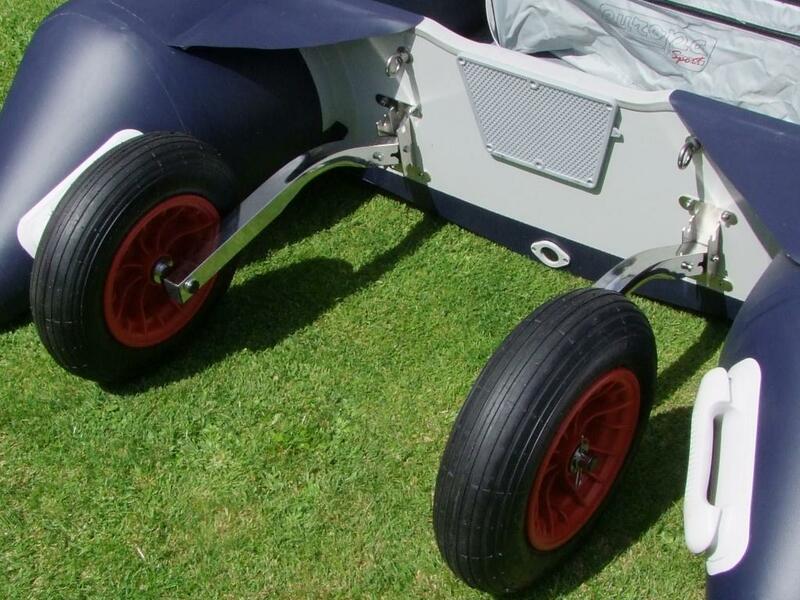 I too hate the air trim tabs, seems like a good idea until you fit the SPECIAL shaped wheels which are twice the price of normal wheels, very tricky when on my own to fit. Oh well we will have to see what santa brings although we will be at High Lodge for the new year so money already spoken for------------bugger. T4... The towing eyes I've fitted are just for helping other smallcraft in an emergency, I've made up a towing bridle which I carry in the anchor bag. I'd only be looking at towing in a kayak, inflatable or small sailing boat etc. Your Force 4 folks are right that it isn't the strongest transom for towing ringos etc. 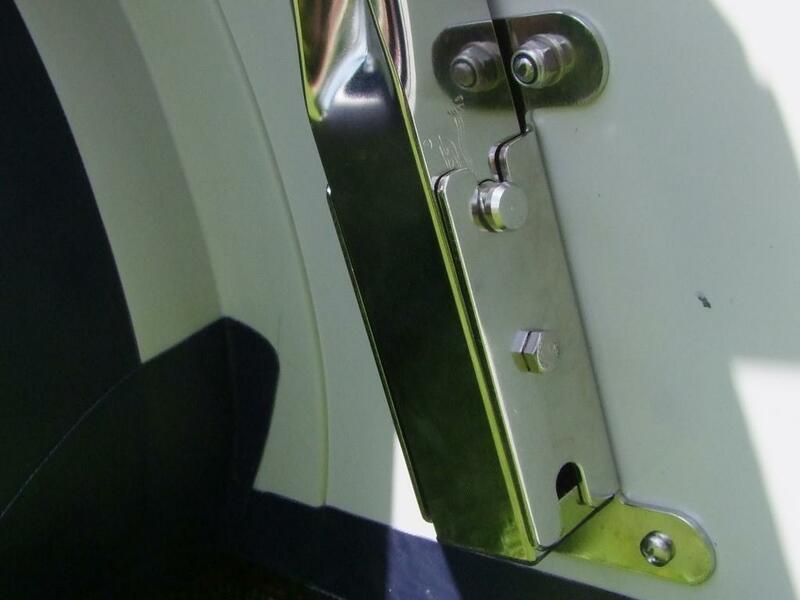 Of course the stress in towing is mainly between the outboard clamp area and the eye holes and it would be possible to reinforce this. The extra bit of outboard pad timber outside the transom is only screwed on and you could replace this with a piece that extended to take in the towing eye area. 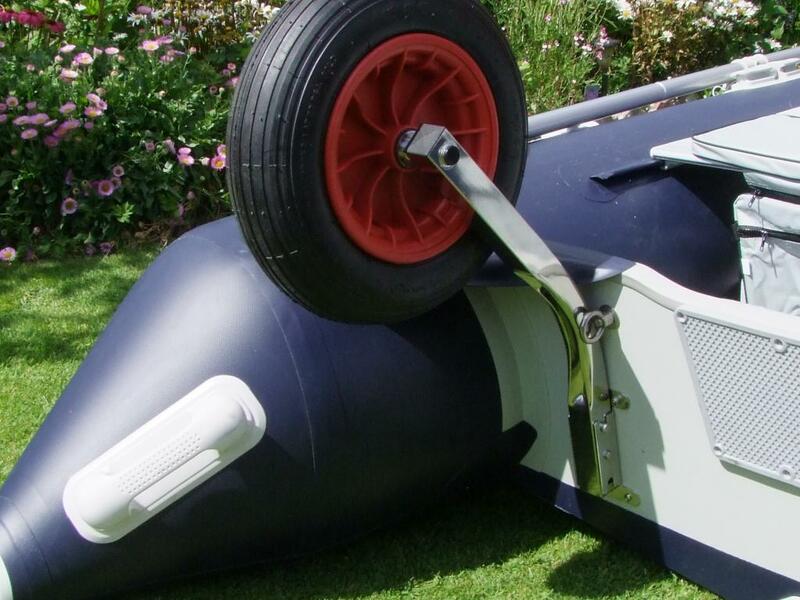 Yep pop your floor out sometime and inflate it upside down to see how the keel sits. The three I've seen have all been the same. For a start the end bosses have all been set on the hose the same (see image below) but the floor and keel are at right angles so that means the hose is applying a twist to the keel. Then if yours is like mine you'll find if you loosen the plastic "bolts" that connect hose assembly to floor and keel then move it about so the hose comes off at various angles you'll get one position where the keel naturally sits up straight. Just as a matter of interest the metal boss in both keel and floor that the hose connects to is exactly the same boss as the one you inflate through on the topside of the floor (with the screw in Delrin valve). So to independently test either keel or floor you can take the hose assy off and fit a spare Delrin valve. At 10yrs old my hose was just starting to perish by the clip securing it to one of the bosses... also one of the plastic bosses had deformed over time to the point when added to a tired O-ring it had a just audible leak however much you tightened it. Well you seem to have the leisure side of retirement sorted! I'd wondered what the special Honwave wheels would be like single handed. It was the single handed issue that caused me to swap the Zodiac ones for swing up Trem types. I likes the Zodiac ones for their simplicity and strength so had them on every inflatable so far. Problem with the Zodiac ones though is sometimes you need a second person to hold them in posn while you screw in the T headed bolt... and of course drop the bolt in the sea and you're stuffed. To be honest the reason I chose the wheels I have is for the ease of single handed use as they can be fitted while the sib is flat on the ground. Once fitted, simply lift the sib and click into the down position, the engine is then fitted. On the water, I just push the top of the wheel shaft down and the wheels just pop up. A bit more effort needed to push the wheels back down for landing but not bad at all. I find they take all the hard work of fitting wheels and holding the sib off the ground out of the equation. Pity you are not closer to High Lodge, you could have come over and I would take you clay shooting. Thanks for the pics... similar arrangement to the Trems as far as use goes. The only little issue with fitting the Trems is the lower "button headed bolt" that need s a couple of extra holes drilling in the transom... right where the rear of the air floor comes to! Great care needed to make sure you don't drill through the floor! Good of you to comment re clay shooting. Due to a father that owned many sporting guns I was bought "my" first air gun at 5yrs old and a .410 at 8yrs. Oddly not laid hands on a gun for the last 40+yrs though so probably a bit rusty. Is that your Excel? Looks just as if it were a Honwave from the materials/construction. Yes it is my Excel, it is available in grey, red or blue , it is only the tube ends that really look different to the Honwave. The same problem for me with the fittings so I have simply used bolts for the top two and screwed into the transom/wood floor retaining blocks to see how it goes. If I need to remove the wood blocks and fit the normal bolts, I will do and just drill out the blocks to take the bolt ends / nuts but so far so good.